Hi guys, I'm new to these forums and I've got an inquiry for you (good start). I've recently purchased a vintage Peugeot off CL, mainly to be used as a beater for commuting around town quickly and efficiently. I've identified the year to be 1977, as the frame's serial number is Y705 etc., and perhaps more simply because it is written "Made in France 1977" on the seatpost. I've looked on numerous vintage Peugeot sites but I still can't seem to identify the model. From what I've read it is most likely the common UO-8, but there are a few dissimilarities between the 1977 Canadian catalog's UO-8 and my bike. The headbadge and decals also seem to be a bit off. My rear derailleur seems to be jimmied (technical term) aswell, I can switch from gear to gear but once I've let go of the tension on the shift paddle it just reverts back to the original position (smallest sprocket). It's not an imminent fix as I'm on the smallest sprocket up front, so its perfect as long as i'm on flat ground. I'm wondering if this is a simple adjustment or not (simplex derailleur, if that helps). Since that bike has a friction shifting system, it is an easy fix for the reverting back to the smallest rear cog. You need more friction on the friction shifter; there should be a wingnut on the side of the shift lever that is loose. Tighten it, and you should be in business. Thanks! There are two spots that look like they can be adjusted with an allan-key, maybe this is what you are referring to? Great! Thanks again. I'll give it a shot tomorrow. UO8-ish. Aztec lugs, stamped dropouts, steel wheels, cottered cranks. All are indicative of a UO8. Decals are correct. Those shifters originally had plastic wingnuts, which are usually broken. Okay, I understand now. There are in fact little wingnuts on the sides of the shift levers, as you mentioned. I was reading a little tired and was thinking solely of the derailleur... (thats my excuse and I'm rolling with it). 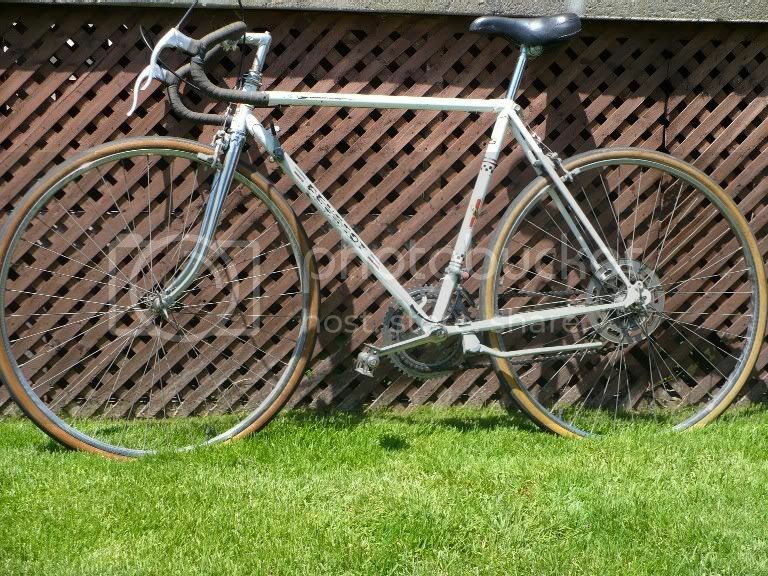 I found a '77 UO-8 on retropeugeot.com that has the same decals, but the shift levers are on the stem as opposed to my downtube ones. My fork is also 100% chrome. Perhaps the previous owner stripped the 3/4 paint scheme off. Perhaps this is a frankenstein UO-8? The fork looks right, so probably the paint was chipping and someone just helped it along. Could be a replacement, but I doubt it. When I stripped off the paint on my PA10 fork, I discovered that the chrome had been clearcoated. Dr. Deltron found the same thing on my PX10. It's a really tough finish that's hard to get off, even with multiple applications Jasco stripper. The nice thing is that the chrome underneath is perfect. The entire fork is chrome, but it is rough where the paint goes. Both forks have been repainted. I took her for a ride after tightening the wingnut, shifting from the 1st-2nd-3rd cog was fine. The 4th did not sound quite right. The wingnut had loosened by the time I had tried for the 5th (largest), and my previous problem came back. I'm hesistant to tighten the wingnut too much, are the any problems that could arise from this? Do you suspect that it's a replacement? I've noticed that the previous owner touched up some chips/scratches, but by the quality of the touch-ups (colour did not match) and generally shape of the bike, I doubt they'd have gone to the lengths that you've described simply to get an all-chrome fork. My UO-8's chrome on the front fork is also clear-coated. The dissimilarities are really bugging me. I've compared some the components of my ride with other '77 models, things don't match up. Mafac "Racer" brakes (found on the '77 PRN10E), DEA "super chrome" rims (? ), "Atom" hubs (found on the '77 AO8). No chainring guard, no stem shifters, both of which are found on the UO8. Over the course of 31 years, it's likely some things have been replaced. Mafac "Racer" brakes are actually pretty good (or can be made so, see the late great Sheldon Brown's site). The downtube friction shifters are IMHO a lot better and easier to use than stem shifters and the good news is that it's still not too difficult to find replacements. You might find that one of the friction washers is worn. If I remember correctly I think they used a fibre washer so a plumber might have one the right size at next to zero cost. I'd suggest working with what you've got to start with and keeping an eye open for parts you might want to replace. I've found that catalogues of European bikes in the 1970's can be misleading as a guide to specification as most contained the caveat "specifications may be changed without notice" - and usually were, depending on the availability and cost of different components almost from week to week! Have fun with your bike and don't forget to ride it! Ok, so I think the problem you're having with the specification is that this is an older bike than 1977. It has the sticker head badge and not the plastic one. That puts it between 1970 and 1976. The plastic one only debuted in 1977 I believe. The earlier UO-8 is spec'ed pretty much like your bike. As for the fork I think it's original, but it's hard to say. Does it have clear coat over any of the chrome? I'm pretty sure someone has just swapped your wheels. Guys, its a U08. The dead giveaway is the headtube lugs, they simply werent used on anything else. It may be a 1978 model.....date codes only tell you how old a bike can be, they dont tell you how new it can be. 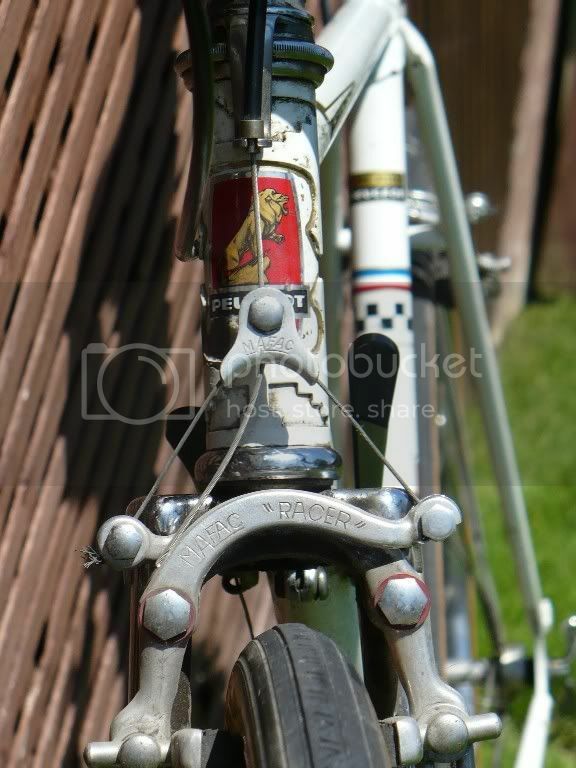 As far as stickers vs. plastic headtube badges........ this link from 1975 takes care of that arguement. I've a 1973 UO which had the plastic headbadge. Dated by colour and downtube shifters; as well as decals. Serial number on mine starts with a "1" but can't be a '71 due to the color, which debuted in 1973. Serial number completely useles for dating Pugs pre late seventies in my experience, I have at least three clear exceptions to the rule in my collection. Had the Adga seat of the earlier UOs as well. The pictured bike looks like it falls in the 75 to 77 range by the decals. Thank you! Perhaps the canadian model offered different components than the american counterpart? The shifter issue was fixed, it was simply a case of lining up the tiny rectangular protrusion on one of the washers into the tiny slot thats on the shifter. This relieves the pressure off the shift lever, which then allows me to shift from high-lo cog with ease. Thank you, again. The lugs argument is clear. The fact that my bike didnt match with the catalog had me curious, but i'll take your word as you seem fairly determined that its a U08. I'll get the drivetrain into tip-top shape, maybe replace the AVA "death stem" (im skeptical), and definitely give her a good clean. If it's not worth restoring, then I'll make sure it's worth riding. Montreal to Quebec City? Maybe it is an AO8. I noticed too that it has a small front hub. My UO8's all have large front hubs and quick releases front and rear. This bike has the big wing nuts instead of QR's like the AO8.